First things first, say hello to my snazzy new lime green lunchbox! Okay, so it’s exactly the same as the last one, it’s just a particularly lairy shade of luminous green. Well we can be certain it won’t get mixed up with anyone else’s lunch at work. On a slightly more serious note though, if you’re constantly running out of tupperware pots, are fed up of leaky old takeaway boxes or your sandwiches wrapped in tin foil always get squashed in transit, then I’d seriously recommend Sistema’s range of lunchboxes. I also use the breakfast pot as it’s great for transporting yoghurt and fruit and keeping all the bits separate so nothing gets soggy and horrible. 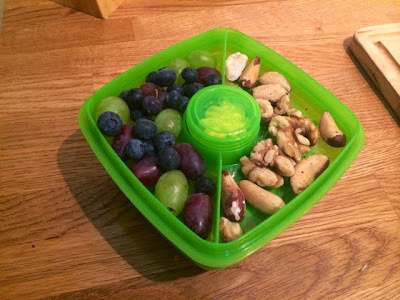 That’s also what I love about this lunchbox, I can take a salad, a dressing and nuts to snack on as well as fruit all in one box without anything getting mixed up, soggy or squished, saving loads of space in my handbag for things like my book to read on the commute. But let’s get back to my actual lunch… I’ve been feeling a bit uninspired in this department of late and have found myself often repeating all of the usual lunchboxes I’ve posted on here. That’s when it starts to get a bit boring for me. I like to mix things up a bit so I think I’m going to start experimenting with wraps soon, I’ll keep you posted. When I was rummaging through the cupboards looking for inspiration before I began making this lunch, I stumbled across some tins of tuna and realised firstly, that I haven’t done a lunchbox involving tuna on here yet and secondly, that I actually haven’t had tuna in ages and couldn’t remember the last time. 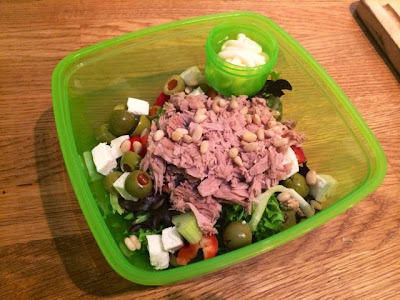 That got me interested in lunch again and I’ve teamed the tuna up with some Mediterranean flavours with feta and pimiento stuffed olives. Regular olives are fine, I just sometimes buy these stuffed ones as a bit of a change, they’re widely available in most supermarkets. 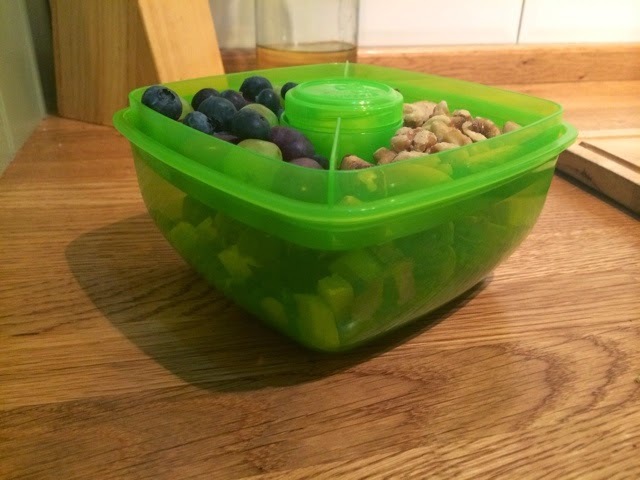 As you can see I’ve also made good use of all the extra compartments in my lunch box by packing in lots of fruit and nuts to snack on too.